Lisa and I recently went on the Austin Cool House Tour co-sponsored by the Texas Solar Energy Society and Austin Energy Green Building. We realized the efficiency retrofits to our home were pretty similar to what we saw on the tour, so for fun I thought I’d write up the green feature list of our house in the same format as used by the tour book. Built as a traditional non-green building, this Austin home has been retrofitted for energy efficiency and simple but high-tech living. Whole-home energy monitor (TED 5000). 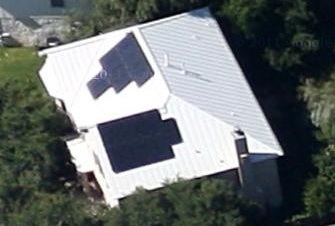 White reflective metal roof (Sheffield Metals CoolR Solar White Galvalume – Reflectivity 0.68, Emissivity 0.85, SRI 82, 25% recycled content, 100% recyclable – installed by Southwest Metal Roofing Systems). Lawn replaced with native plant and prairie garden which requires almost no supplemental watering. Crushed granite and limestone paths allow water penetration. Mature trees provide shade. R-38 insulation in attic with R-8 ductwork. R-9 garage door insulation. 1 gpm low-flow showerheads (from New Braunfels-based Bricor). Shut-off values on showers for optional Navy shower. Solar screens on all windows. Energy Star appliances from the highest CEE efficiency tier (dishwasher, refrigerator, clothes washer and dryer). Energy Star electronics. 19 SEER multi-zoned HVAC system with variable speed motor and fan coils, and programmable thermostats. Masonry and fiber cement siding and trim (Hardiboard). Ethernet networking (Cat6) and high speed Internet connection enables telecommuting to save energy and reduce emissions. Energy-efficient computers. Notebook and Home theater systems that sleep when not in use. Easy access to transportation – bike lanes, public transportation (bus stop 0.4 miles away), two light rail stations nearby (4.0 and 5.2 miles). Any other ideas for increasing energy efficiency or going more green? Leave the in the comments!